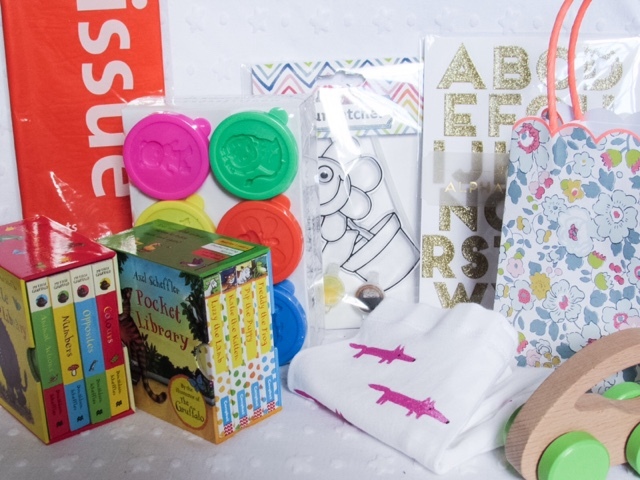 Party bags can be a source of stress for parents - what to fill them with? What about the extra cost? How to cater for the variety of ages/genders? We decided to brave the topic of party bags for Isabella's birthday party and create some for the guests who were children. As it was Isabella's first birthday party she was too young to invite her 'friends', so we chose to invite everyone who has been significant in her first year of life. It was incredibly special to have so many people who love and care for Isabella altogether, including six children. This made the task of party bags for the children much more manageable and in fact turned into one of my favourite aspects to organise. 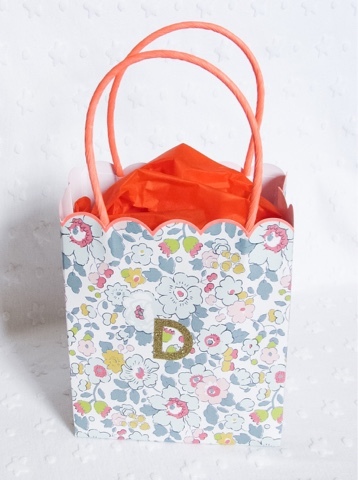 Perhaps due to these stunning Liberty Betsy Party Bags* from Party Pieces (£6.99 for 8 pack) - though their beauty made me not want to give them away! If you are going to do party bags I'd recommend buying them before thinking too much about their contents because their size will depend on what you can fit in them. We set a budget of no more than £5 per bag for the contents (due to only having such a small number of children coming. It would have been a lot less if we'd had more coming). Now I'm not usually very good at sticking to a budget, especially when it comes to anything baby related, but this time they actually came in under budget. The first item I knew I wanted to include was a pair of hand printed leggings (see how I hand print baby leggings here). They're low cost, completely bespoke and add that personal touch. We had 5 girls and 1 boy that came to Isabella's party, so I bought a few 12-18 month white leggings from F&F Clothing sale for £1.50 each, a 2 pack of 9-12 month pink leggings from Peacocks for £5 (Next also have leggings for £2.50-£3.50) and a pair of 18-24 month blue joggers from F&F Clothing for £4. As I already had the resources to hand print the leggings/joggers, these were a very affordable addition to the party bags. The second item we wanted for the party bags was a book of some kind, as Isabella had been loving looking at books on the run up to her birthday so we hoped they'd appeal to the other children coming to the party. Due to the size of the party bags and the leggings we already had inside them, we needed relatively small books. By searching for 'Mini/Little/Pocket Library Board Books' we came across a wide range of small books that came in sets of 3-4, making them affordable additions. 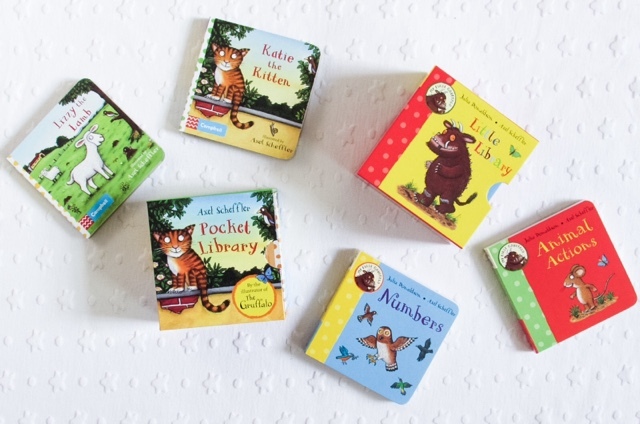 We settled on buying My First Gruffalo Little Library (£3.74 for a set of 4 books from amazon) and the Axel Sheffler Pocket Library (£3.99 for a set of 4 books from amazon). The books therefore cost around £1, averagely making the worth of the party bag contents approximately £3.50. The final item we settled on for most of the party bags was a little tub of Kid's Dough from Tiger (£3 for 6), as it's a fun sensory experience and appeals to all ages. These little tubs from Tiger worked out at 50p each and even have a different animals imprinted on the top of each lid. 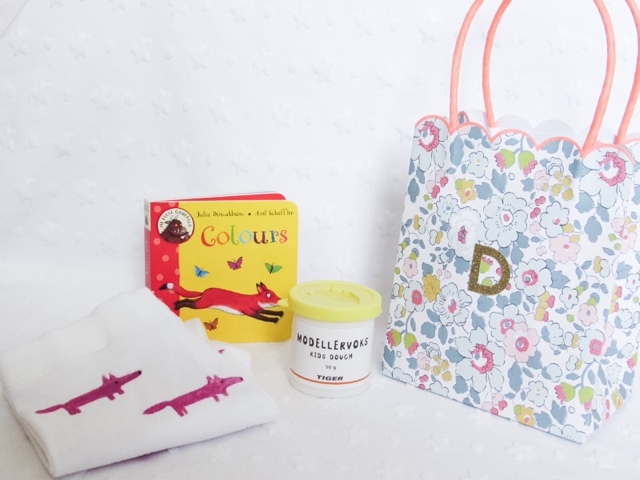 Tiger is really worth checking out as it had a fantastic range of small goodies that could have fitted in our party bags, including a draw-your-own puzzle. For the slightly older children we got a paint-your-own Flower Pot Suncatcher from Hobbycraft (£1 - many other designs available too) and a push along wooden car from Sainsburys (90p in the sale). 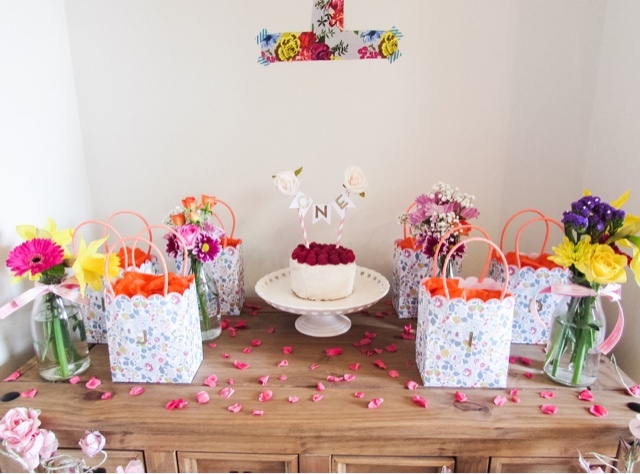 I topped each party bag with some bright orange tissue paper from Hobbycraft (90p for 5 sheets), in order to hide the surprises inside. 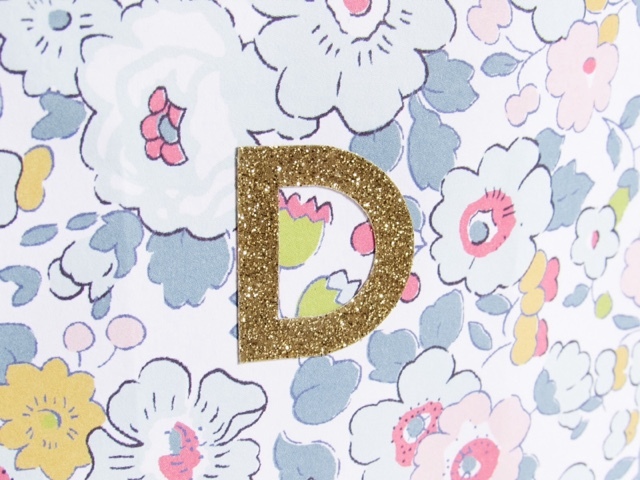 I also stuck on the first letter of the recepiants name onto each bag using the Meri Meri Gold Glitter Alphabet Sticker Sheets from Berrylune (£4.95). 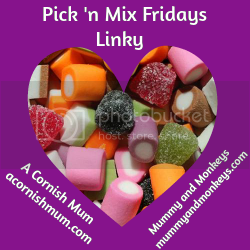 What do you like to include/receive in party bags? I love getting books in party bags, think it's fab to have something "proper" rather than the junk you usually get. For my daughters 3rd birthday yesterday I gave out mouldable foam soap for the bath, and a big tube/wand of bubbles. I hate getting lots of little "party bag fillers" like whistles which just end up in the bin. Such a waste of money. I love the little pocket books. Definitely need them in my life. How amazing!! 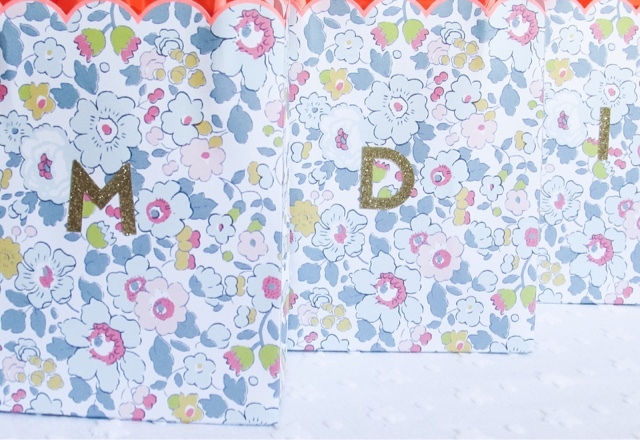 You have put me to shame as Mia is 3 next week and I opted for pre-filled party bags online! :) These look incredible and so well thought-through! Love them!